Psychosis & Hallucinations | American Parkinson Disease Assoc. What is Parkinson’s disease psychosis? Diagnosing and treating this condition can be complex. The condition relates to both neurology (the branch of medicine that deals with the nervous system) and psychiatry (the branch of medicine that is focused on mental and behavioral health). For this reason, Parkinson’s disease psychosis is considered a neuropsychiatric condition, since it deals with mental health symptoms (hallucinations and delusions) caused by a disease of the nervous system (Parkinson’s disease). What causes Parkinson’s disease psychosis? Dopaminergic therapy increases dopamine levels, helping improve motor symptoms in patients with Parkinson’s disease. However, increasing dopamine levels can also cause chemical and physical changes in the brain that inadvertently lead to symptoms such as hallucinations or delusions. Who’s at risk for Parkinson’s psychosis? What are the symptoms of Parkinson’s disease psychosis? and confusion. Those with heart rhythm disturbances should avoid taking this medication. Why isn’t there a greater awareness of Parkinson’s disease psychosis? It’s not uncommon for people with Parkinson’s disease psychosis to remain silent about their experiences.2,4,9 In fact, only 10% to 20% actually report their symptoms to their physicians.4-9 Work continues to be done to raise awareness of this condition. 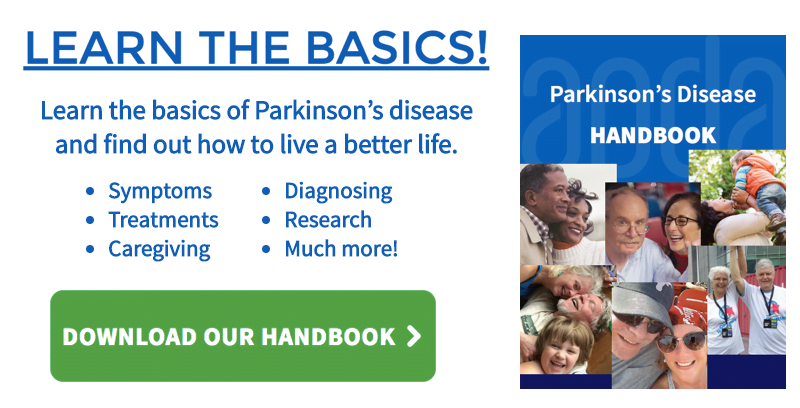 You can find more information on the non-motor symptoms associated with Parkinson’s disease here. First and most importantly, if you find yourself experiencing symptoms such as hallucinations or delusions, speak out. It is essential to talk about your full range of Parkinson’s disease symptoms with your treatment team. A dialogue among patients, care partners, and physicians is a critical component of the effective management of your condition. References: 1. Forsaa EB, Larsen JP, Wentzel-Larsen T, et al. A 12-year population-based study of psychosis in Parkinson’s disease. Arch Neurol. 2010;67:996-1001. 2. Ravina B, Marder I(, Fernandez HH, et al. Diagnostic criteria for psychosis in Parkinson’s disease: report of an NINOS, NIMH work group. Mov Disord. 2007;22:1061-1068. 3. Holroyd J, Currie L, Wooten GF. Prospective study of hallucinations and delusions in Parkinson’s disease.) Neural Neursurg Psychiatry. 2011;70:734-738. 4. Fenelon G, Mahieux F, Huon M, Ziegler M. Hallucinations in Parkinson’s disease: prevalence, phenomenology and risk factors. Brain. 2000;123:733-745. 5. Wolters ECh. PD- related psychosis: pathophysiology with therapeutical strategies. J Neural Transm. 2006;71:31-37. 6. Goldman JG, Holden S. Treatment of psychosis and dementia in Parkinson’s disease. Curr Treat Options Neurol. 2014;16(3): 281. 7. Goldman JG, Vaughan C, Goetz CG. An update expert opinion on management and researcl, strategies in Parkinson’s disease psychosis. Expert Opin Pharmacother. 2011; 12(13):2009-2024. 8. Data on file, ACADIA Pharmaceuticals Inc. 9. Fenelon G, Alves G. Epidemiology of psychosis in Parkinson’s disease. } Neurol Sci. 2010;289:12-17.